Background: Overuse of antibiotics has become a serious ecological problem worldwide. It is necessary to monitor and control the pollution of antibiotics. Kanamycin is a representative antibiotic and has widely been used to treat a wide variety of infections. Although different methods have been established for kanamycin detection, it is still of great significance to develop new sensing approach to kanamycin monitoring. Methods: Graphene and Cadmium Sulphide (GR-CdS) nanocomposites were dispersed in 0.035% chitosan (CHIT) aqueous solution containing 0.52% acetic acid. Then, Glass Carbon Electrode (GCE) surface was coated with 5 µL of 1 mg·mL-1 GR-CdS suspension. The GR-CdS-CHIT modified electrode was immersed in 0.5 mg mL-1 single-stranded DNA (ssDNA) solution and 0.5 V potential was applied for 200 s to immobilize ssDNA on the electrode surface. Results: GR-CdS-CHIT dramatically promoted the electrochemical oxidation response of guanine residue in DNA. ssDNA exhibited higher oxidation peak current than double-stranded DNA (dsDNA). Under optimal conditions, ssDNA/GR-CdS-CHIT/GCE was prepared and used as the sensor to determine kanamycin, which showed a linear response to kanamycin in the concentration range of 0.10 to 1.0 mg mL-1. The proposed sensor was successfully applied to monitoring photodegradation of kanamycin. Conclusion: ssDNA was effectively immobilized on GR-CdS-CHIT modified electrode and exhibited high electrochemical oxidation response. When kanamycin was present in the solution, the electrochemical oxidation peak current of ssDNA on the modified electrode declined due to the interaction between kanamycin and DNA. Thus, a novel electrochemical DNA biosensor for kanamycin was successfully developed. 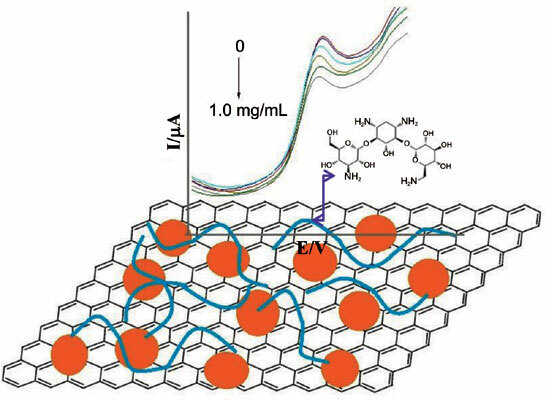 CdS, differential pulse voltammetry, graphene, kanamycin, photodegradation, single-stranded DNA.